The time comes. A Siberian Husky lifts up its head. There is an untested adventure beyond. Time to go. Labrador or Golden to await its master’s arrival. The Siberian is not content here. Northward is its trail…. where Siberians gather, North of the Rainbow Bridge. with its beloved person, never to be parted again. multicolored team leaping and whirling with joy. Timber was one of our rescues that we were blessed to share 4 years with. Though he left us far too soon, we know we'll meet again at the Rainbow Bridge. Run free, we love you and miss you every day until we meet again. Rockie was one of the best things to have walked into our lives. We were so blessed to have had him in our lives for 7 years. We sadly lost him to a very aggressive form of cancer. Run with your buddy Timber, pain free, North Of The Rainbow Bridge- we will meet again someday. We love you forever, and miss you dearly. 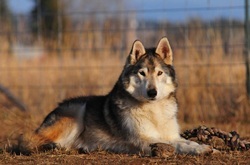 Dakota introduced us to the Siberian Husky in 2004. He was our first, the one that started this whole journey, and though he didn't come from the most reputable breeder or have the most prestigious pedigree he had the heart of a Champion. He gave his all in everything he did and did it with a smile on his face. Dakota passed peacefully at home, surrounded by those who loved him dearly. Wear your Silver Harness proudly, you more than earned it. Until we meet again, we love you buddy. Juneau came into our lives in 2006. She too has lived her life as a very pampered pet. 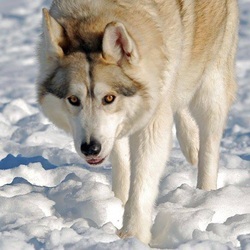 She definitely taught us, and Dakota, a thing or two about what a Siberian was REALLY like. With a thing to say about literally everything, our dog yard is a lot quieter these days since you've been gone. I'm sorry it's taken so long to say goodbye to you sweet one...it's impossible to admit you're really gone. I know Dakota has welcomed you home properly.